The Qlik Sense® application, deployed with the assistance of Keyrus experts by the head office of Best Western France, is boosting the value of the services it delivers for Best Western hotels in France, and making them more responsive to changes in their business. Keyrus announces that it has helped Best Western France deploy the Qlik Sense® solution to bolster its performance management. Best Western France, a grouping of almost 300 indepentent hotels in France, provides its franchisees with central reservation and other services that help them improve their performance in terms of occupancy rates and revenues. 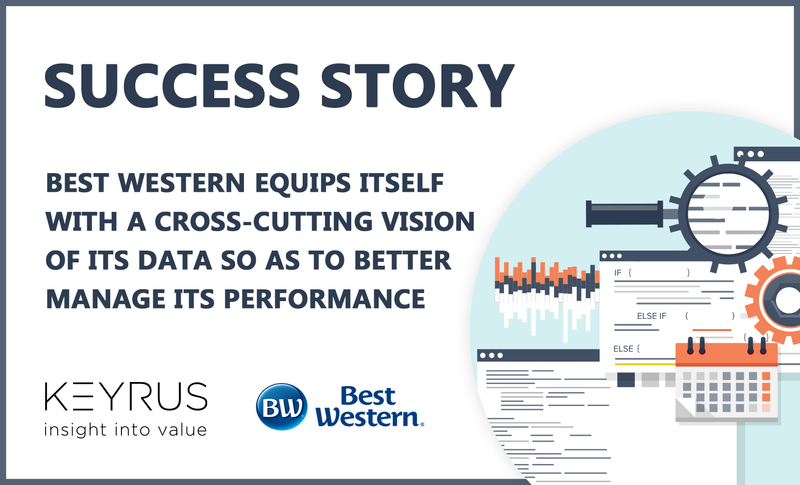 With the aim of enhancing the scope and value of those services, in late 2015 Best Western France chose to adopt the Qlik Sense® visual analysis solution. It called upon Keyrus's expertise in Qlik solutions for the design of an application that would give its head office teams a 360° vision of each hotel's performance, by utilizing all available internal and external data. The stimulus for the project given to Keyrus was a pressing need to replace an existing tool that the hotel chain was about to cease producing. "We had little time in which to choose the new solution, but I saw in that an opportunity to move to a tool that was more ergonomic, less static, and could be used by more employees than the one we had", explains Bruno Rossolin, Administrative & Financial Director of Best Western. It was by virtue of these criteria, as well as the extent of its graphic possibilities, that Qlik Sense® stood out as the best choice, and all the more naturally so given that the solution was already being used successfully by Best Western Italy. "To implement this project, Qlik introduced us to Keyrus, whose expertise and experience ensured that we would be able to deploy the solution as we needed to, and within a very short time frame". This change of tool was also an opportunity to thoroughly review the data sources that head office, and especially the Revenue Management department, could use to monitor the hotels' performance and provide them with more detailed information more regularly, accompanied by more personalized advice. "Keyrus's input proved to be decisive. The Keyrus people we worked with were highly skilled, and they helped us understand our data, take back control over them, and structure them in a way that enables us to make sustained use of them", emphasizes Bruno Rossolin. Indeed, it was on the advice of Keyrus that the decision was taken to create an independent data warehouse, grouping together all the data sources useful for measuring performance: reservations data transmitted by the central system of Best Western France and by platforms like Booking.com and Expedia, data from the CRM, and information from the market of suppliers specialized in the hotel trade. "The structuring of this database was an important part of the project", specifies Sakil Mamodeally, Smart Data Practice Manager at Keyrus. "It is the database that feeds the Qlik Sense® application and enables Best Western to control its data sources, whilst also allowing it to integrate new ones, so as to enrich and expand its analyses and the performance reports they generate." Today, Qlik Sense® is used by some forty employees at the head office of Best Western France, unlike the previous application, which was used by only five people. The Qlik Sense® application has made it possible to automate the production of regular reportings in PDF digital format (via Qlik Nprinting), whereas before, they were distributed in paper form. Once every month, these new reports are sent to the hotels, thereby giving them an overall view of their performance. At head office, the Revenue Management Department uses Qlik on a daily basis to monitor and analyze the hotels' performance according to category, brand, region, source of reservations… The application also enables it to advise individual hoteliers on whether to adjust their prices according to the period, state of the market, reservation volumes, and cancellation rates observed. "Qlik has brought about a cultural change within our grouping and become an indispensable tool", considers Bruno Rossolin. "The application has notably served to demonstrate the added value provided by our Revenue Management department, whose know-how is now widely acknowledged by our members." Access to Qlik Sense® is also available for the Network Management department, commercial team, and Development department. Indeed, as part of the process of recruiting new establishments, the Development department uses it to present to hoteliers the revenues they could achieve by joining Best Western France, based on the characteristics and location of their hotels. Best Western France plans in the short term to use Qlik Sense® to invoice the commissions on the revenues of the hotels, and also to integrate CRM data used by the grouping at European level, so as to give itself a more comprehensive customer view. This new integration will enable Marketing to use Qlik to enhance customer insight and optimize its campaigns. "Customer insight and real-time knowledge of operations are more crucial than ever in a hotel market in which competition from online intermediaries and alternative forms of accommodation is becoming increasingly keen", concludes Bruno Rossolin. "Against this backdrop, retaining control over data, and being able to utilize them so as to become more effective at understanding customers and anticipating market changes, is, in itself, a key factor in performance. The Qlik Sense® application, and the assistance from the Keyrus experts, are enabling us to assert this advantage, whilst at the same time fostering the development, internally, of a data-driven culture."